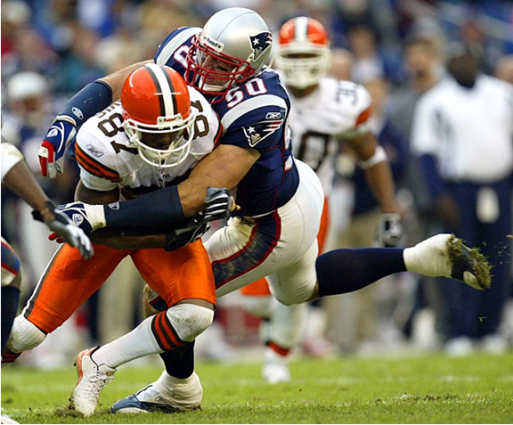 I'm spending 50 days ranking the top 50 players of the Bill Belichick Era, from No. 50 down to No. 1. (Click here for a criteria on how I made my selections.). Enjoy. Today we reach . . . . There were Patriots players faster than Mike Vrabel. There were stronger Patriots and quicker Patriots. Some had softer hands or superior hand-eye coordination. A few could probably jump higher. But no Patriot in the almost 20 years I’ve covered the team was as far above average in each of those physical categories than Mike Vrabel. I’ll get to the mental aspect of Vrabel’s game in a bit, but first I want to make sure that his physical ability doesn’t get short shrift. He was like a decathlete, able to cross disciplines and excel in all of them. One of the simple pleasures of covering a game when Vrabel was a Patriot was seeing him on the field warming up before a game. He must have spent 20 minutes running routes and catching passes downfield. He didn’t just look like a tight end -- a position he moonlighted at -- but he looked like a very good tight end. And when he threw the ball back to whoever he was working with, it looked (based on arm strength) like he could draw a paycheck at that position, too. The Patriots signed Vrabel in 2001 as a free agent. He spent the first four years of his career in Pittsburgh but couldn’t crack the Steelers’ 3-4 as an outside linebacker. The Steelers would come to rue letting him go. The Patriots didn’t know what they had in Vrabel at first. By the end of his first year in Foxboro -- when Vrabel wasn’t charged with a single mental mistake the entire season -- they did. He would up playing in all but three regular-season games in eight seasons with the Patriots. He played outside linebacker, defensive end, inside linebacker and tight end. That he wasn’t a Pro Bowler can’t be held against him. Check out 2003, for instance. He played 13 games, had 52 tackles, 9 1/2 sacks, two interceptions, four pass break-ups and four forced fumbles. He had three more sacks in the playoffs and a late touchdown against the Panthers in the Super Bowl. In addition, his strip-sack of Jake Delhomme late in the first half led to a Patriots touchdown in that Super Bowl, the same way his pressure of Kurt Warner in Super Bowl 36 forced the pick-six thrown to Ty Law. Belichick traded Vrabel to the Chiefs in 2009. That was one of a slew of departures that created a leadership void and really closed the book on the first nine seasons of the Patriots' run of excellence. When he was traded, Belichick said in a statement, "When Mike arrived in 2001, we knew we were adding a solid outside linebacker. But where Mike took it from there exceeded our highest hopes. Mike Vrabel epitomizes everything a coach could seek in a professional football player: toughness, intelligence, play-making, leadership, versatility and consistency at the highest level. "Of all the players I have coached in my career, there is nobody I enjoyed working with more than Mike. In the same way people recognize guys like Troy Brown, we appreciate and thank Mike Vrabel. He is one of the very special Patriots champions."